A few weeks ago, I published links indicating the presence of various World Methodist Council member denominations in countries around the world. 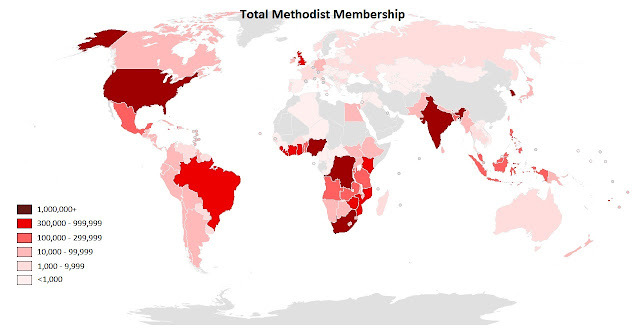 Now, with some additional research (using the World Christian Database, the World Methodist Council website, and denominational websites), I have been able to compile maps showing total Methodist/Wesleyan membership by country and Methodism/Wesleyanism as a percentage of each country's population. Those maps are below. First, a couple of caveats: I did not include the membership of United/Uniting denominations that are part of the World Methodist Council. I did not think it was fair to include all members as "Methodist" when these churches were formed out of the mergers of many Protestant traditions. Also, data is never perfect, and the data these maps are based on may not be perfect, especially in the case of smaller countries or countries with small Methodist/Wesleyan presence. In particular, I was not able to get country-level data for The Wesleyan Church, the Methodist Church of Southern Africa, the Methodist Church of the Caribbean and Americas, and the Korean Methodist Church outside Korea directly from those denominations' websites, so I am relying on the less accurate WCD data for them. Overall, these maps indicate that Methodism/Wesleyanism's areas of greatest strength are the United States, coastal West Africa, South Korea, the Democratic Republic of Congo, southern Africa, the Caribbean, and parts of the Pacific. 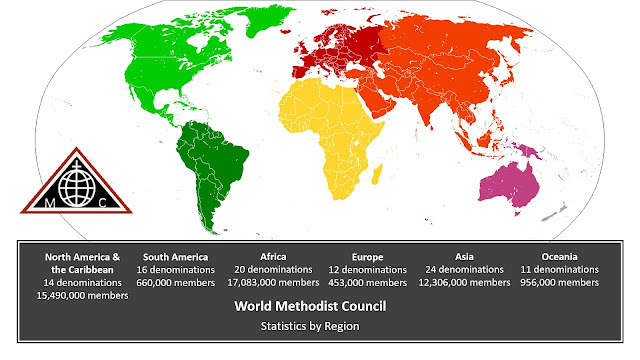 Methodism/Wesleyanism has a moderate presence in Latin America, south Asia, and southeast Asia. It is weak in Europe and central Asia. It is mostly non-existent in the Muslim world. Note that those countries with large Methodist populations have a large total population and/or a large percentage of the population that is Methodist. The United States has by far the largest number of Methodists/Wesleyans. 6 of the top 10 countries with the most Methodists/Wesleyans are African. Most of the countries with the highest percentage of Methodists/Wesleyans in the population are small island nations in the Caribbean or Pacific with low overall populations. 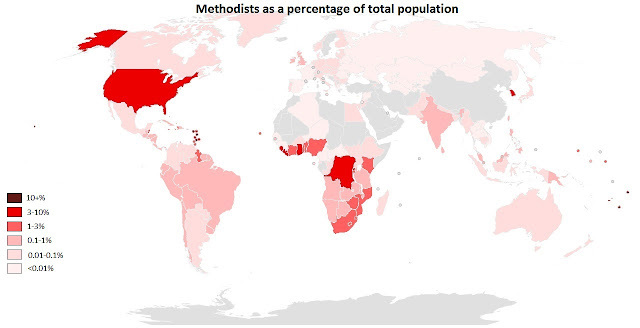 Liberia is the non-island nation with the highest percentage of its population that are Methodist/Wesleyan (6.9%), and it does not make the top ten. 6 of the top 10 most Methodist non-island nations are African.